My least favorite kitchen activity is mincing garlic. My favorite treat is a Cadbury Cream egg. Okay. I hate, hate chopping garlic. Basically because I’m terrible at it. I don’t have knife skills, and when I have to mince it, I end up with a full garlic clove with some knife scores in it. Thankfully we have a lovely garlic press that gets ample use and keeps me from making a mess and ending up with garlicky fingers. This week I got lazy and didn’t want to make the huge sacrifice of fishing the press out of the dishwasher, and I decided to go ahead and mince it myself. I grab a few cloves, semi-chopped them, threw the chunks into the pot and headed over to the fruit bowl to toss the rest of the head in. My heart fluttered as I caught sight of the tell-tale red, blue and green foil flashing up at me. I had forgotten that Davey brought home a Cadbury egg earlier in the week to surprise me. I heard the Heavens open and beseech me to treat myself. Not one to ignore the heavenly hosts, I daintily (greedily) ripped into the foil and bit in… Oh divine nougat. I mean, Um. Garlic. Because who has time to wash their hands after mincing? “Not I,” said the duck. Undeterred, I just kept munching. Only in the end I was honestly pretty pissed. At myself, at the garlic, at the egg. I had tainted the thing I was most excited about because I didn’t set boundaries. What an idiot. Except, I do that daily in my life. All the time. I’ve been seeing a counselor for the past couple of months, and I adore her. Side note: is there any feasible way to ask your therapist to hang out as friends? Like, hey, ummm, do you want to go get some wine after this and just Netflix and chill? At the same time? In the same place? Sigh. Thanks “issues,” for ruining a potential BFF-ship. Anyway, she’s helped me see that the way I cope with emotions is by piling more and more tasks on my plate, so that I don’t have time or energy to process the hard things. I let productivity take priority over process. Then I get angry, manic and overwhelmed that “must-dos” bleed into my moments of exhalation and “want-to-dos.” I let the garlic bleed into my Cadbury. Here’s where I usually stop. I cling to an analogy that really sticks with me, and that feels like addressing the issue. 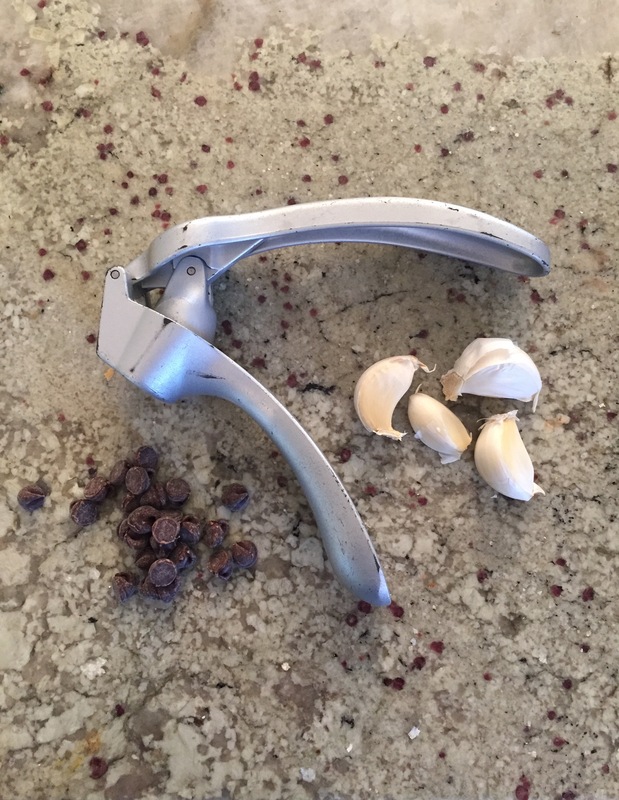 I never push myself further than awareness, and in this next season of growth, I have to tackle action steps (literally, these would have been something like… get the garlic press, moron. Or, wash your hands, ya filthy animal. Or, how about we not shove chocolate in our faces at 3:00 in the afternoon, sweet cheeks?). Emotionally and spiritually, I don’t know what those are yet, but I’m working on it. Maybe sharing it here is enough (it isn’t). The obvious answer would be to intentionally clear out margins, build and maintain boundaries. Here’s the thing about boundaries… It’s not enough to set a fence in the ground and then get irritated when it begins to develop wear and tear and not keep out varmints. Fences, walls and boundaries are hard to build, and they require active maintenance. I would love to know how you keep your garlic out of your desserts. Oh, and speaking of garlic AND chocolate, here are the things we ate this week. They were really delicious. Crockpot Chicken + Gnocchi Soup – A hit all the way around the dinner table and oh-so-easy. One Pot Creamy French Onion Pasta Bake – Standing ovation to Davey for making this for us last night, so I could head to the gym and create that margin for myself. I sure love that dude. Charred Coconut Chicken – Yum. Chicken Enchilada Quinoa Bake – Except I used ground beef because I had it and needed to use it. I’ve made this several times before and prefer it with chicken. Chicken Stew + Biscuits – Not too shabby. Nutella Espresso Brownies – Here’s a surprising hint that I’ve learned from experience… these are so much better with regular cocoa powder NOT dark chocolate cocoa powder.